If you were to tell us that you put no thought whatsoever into the kind of shoe you’re wearing, we’d tell you that you’re in the minority! Most of us take our time to find shoes that are comfortable, fit well, and show a little personal style. Those with foot or toe deformities. Anyone with arthritis of the big toe, an advanced bunion, flat feet, or hammertoes knows that the days of cramming their feet into narrow shoes or high heels are numbered, if not already a thing of the distant past. The stylish shoes they’ve always loved are just too painful to wear. People with diabetes. Individuals with diabetes understand that, for their own safety, they’ve got to wear shoes that minimize pressure and promote good circulation. extra depth to accommodate orthotics or feet that swell. 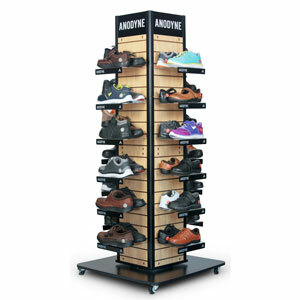 We’re so pleased to have added the Anodyne line to our collection of shoes and insoles for our patients with special needs. Monmouth County residents with diabetes, neuropathy, plantar fasciitis, or toe deformities may benefit from these prescription shoes. We encourage you to contact Dr. Samantha Boyd, Dr. Hal Ornstein, or Dr. Joseph Saka for a professional evaluation and fitting. One more piece of good news: insurance generally covers the cost of such shoes, so give us a call at (732) 905-1110, or make an appointment online.